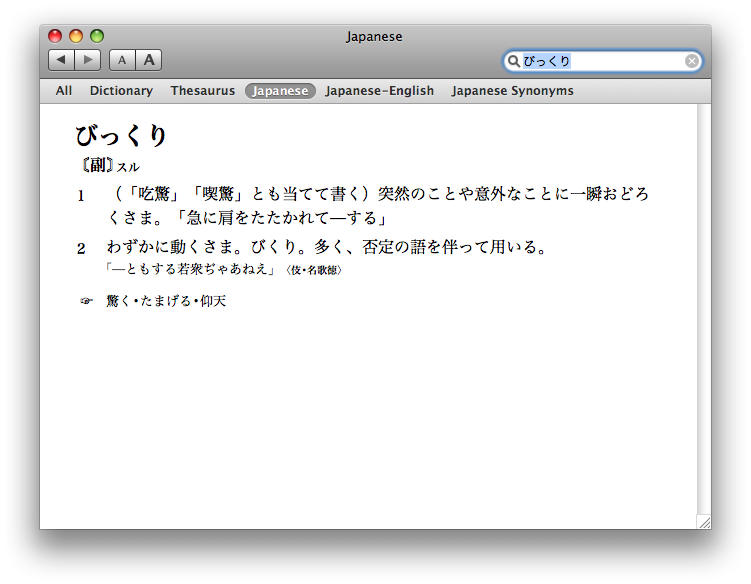 Archive of articles classified as' "japanese"
Use the Mac OSX built-in Japanese Dictionary! 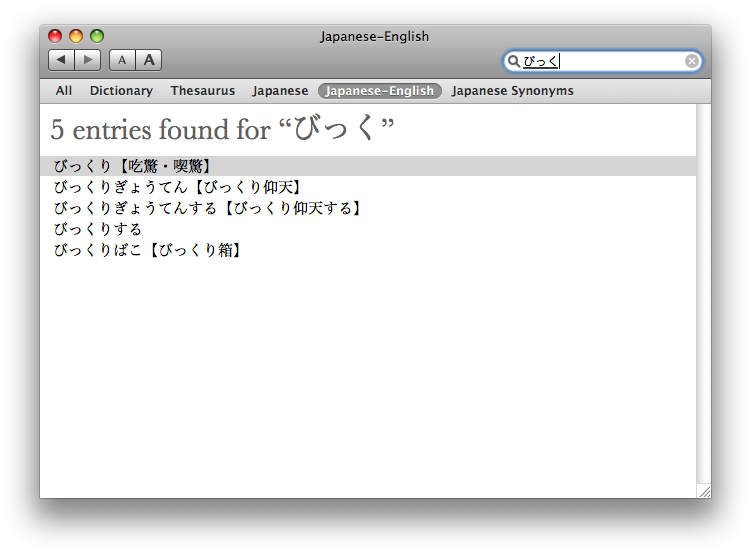 This is perhaps one of the best-kept secrets of Mac OSX (10.5 or later) that any Japanese student should know about: the Dictionary app, inside your Applications folder, has a built-in Japanese Dictionary. 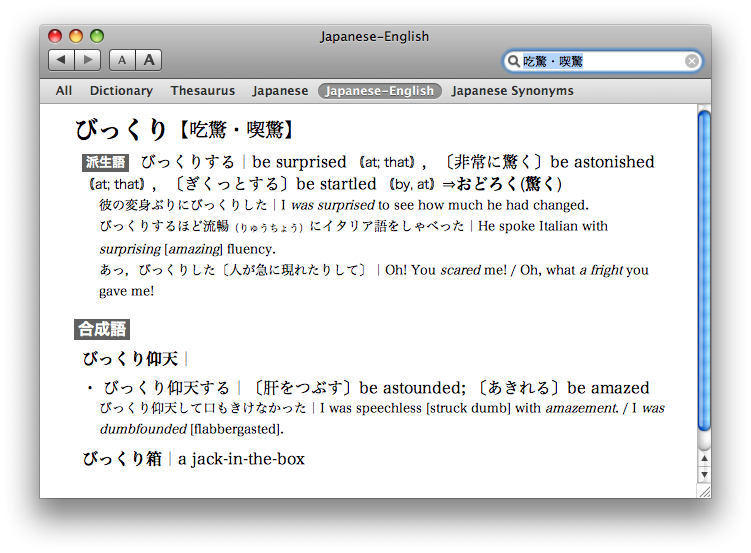 Koichi over at Tofugu just wrote an article about Why you should use a Mac to study Japanese, but I think the built-in dictionary is definitely one of the best resources on the Mac for Japanese. 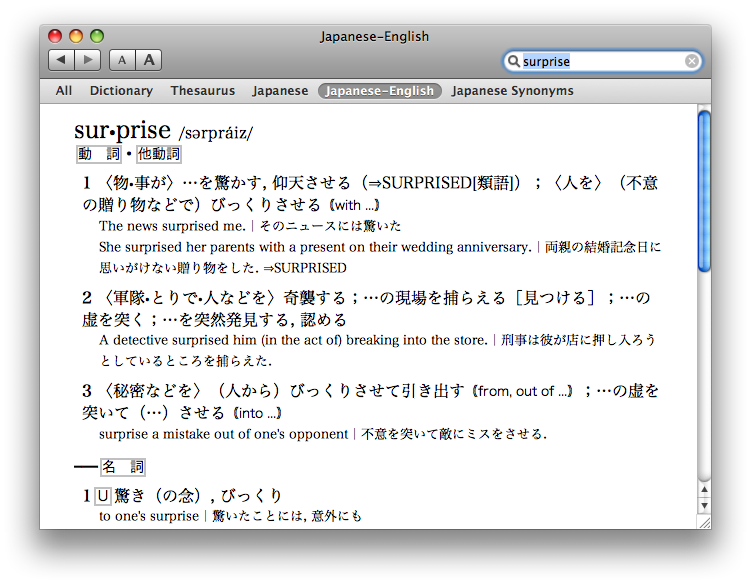 I had my MacBook for approximately two years before I even realized there was such a dictionary (would have been really helpful to know about during the year I lived in Japan and had my MacBook!) and it seems a lot of people I’ve talked to also don’t know about the Japanese dictionary. The dictionary gives you a very standard-Japanese definition (not a lot of slang or new words) but it’s very solid and extremely helpful. This dictionary isn’t perfect, but since it’s a desktop app that doesn’t rely on an internet connection, it’s been extremely useful. I generally use it as my primary dictionary, and then seek other resources if I need them (like jisho.org for kanji-lookup, for example). I also used the Dictionary app during exams for my Japanese translation class this semester — we were allowed to have dictionaries, but no internet connection (I suppose so we wouldn’t chatting with other people taking the exam, or something like that). 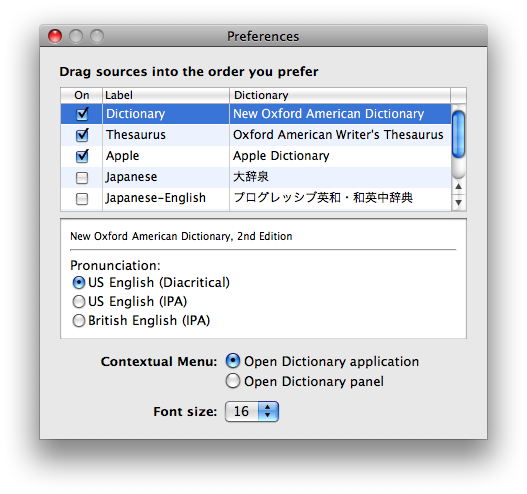 As a Mac user/Japanese learner I’m excited about the cool new things Koichi mentioned, like the new Chinese input method that will come out with Snow Leopard, but I just wanted to make sure you don’t miss the built-in dictionary like I did!